Philadelphia is the largest city in Pennsylvania, and the 5th most populous in the United States over all. As of 2005, Philadelphia's population was estimated as 1,463,281, with 5,823,23 living in the metropolitan area. The city is known as the "City of Brotherly Love" as its name stems from the Greek, philos (meaning "love") adelphos (meaning "brother"). Other nicknames include "Birthplace of America", "Cradle of Liberty", "The Quaker City", and simply "Philly". Probably the best known educational institution in Philadelphia is the University of Pennsylvania, which is coeducational private non-sectarian research university. The university of Pennsylvania was founded in 1740, and is one of the eight members of the Ivy League. Professional sports teams in Philadelphia include the basketball team, the Philadelphia 76ers, the ice hockey team, the Philadelphia Flyers, the ice hockey team, the Philadelphia Phantoms, the Major League Baseball team, the Philadelphia Phillies, and the NFL American football team, the Philadelphia Eagles. Some of the major companies with their headquarters in Philadelphia include Cigna, CIGNA, Comcast and Sunoco. The main airport serving Philadelphia is Philadelphia International Airport. Philadelphia is home to the "cheesesteak" - known outside of the city as "Philadelphia cheesesteak", "Philly cheesesteak", or "steak and cheese". It is a sandwich made in a long Italian roll, filled with thinly sliced pieces of steak and melted cheese. Optionally, grilled onions, sautéd green peppers, mushrooms and sauces may be added. In 1776, the Declaration of Independence was read out in three cities: Trenton, New Jersey, Easton, Pennsylvania, and of course, Philadelphia. Philadelphia's nicknames include "City of Homes", "Filthadelphia or Filthydelphia", "Philly", "Quaker City", "The Athens of America", "The Big Scrapple", "The City of Brotherly Love", "The City That Loves You Back", and "The Workshop of the World". 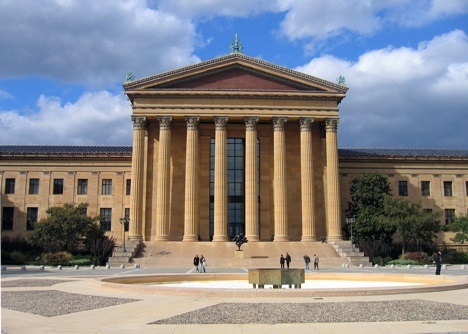 25 Secrets you’d never find out about PHILADELPHIA! Welcome to the most Complete Philadelphia Travel Guide for Tourists made by locals! If you are heading to the wonderful city of Philadelphia anytime soon this book will give you an insight of the best places and most unique places to see where you will mingle with the locals and get to see and do the activities as one of them. Most people don't even take the time to prepare themselves in advance, and just wish for the best once they have arrived! Most people aren't aware of some of the most amazing places Philadelphia can offer... And it'd be such a pity to miss them! That's precisely why we desperately need the RIGHT travel guide first. Don’t arrive to Philadelphia (Pennsylvania) and follow the crowds of Tourists. With this exclusive travel guide made by locals you will be finding about the places that don’t come on Lonely Planet’s or are listed on Trip Advisor where thousands of tourists head daily. Our goal is simple. we will give you a complete and detailed Bucket list with MAPS to all the locations to make sure you won’t get lost in the amazing city of Philadelphia transforming your trip into absolutely amazing experience. We will help you simplify your path, showing you exactly where the best places are. Greater Than a Tourist- Philadelphia Pennsylvania USA by Lindsey Todd offers the inside scoop on this historic and beloved location. Most travel books tell you how to travel like a tourist. Although there is nothing wrong with that, as part of the Greater Than a Tourist series, this book will give you travel tips from someone who has lived at your next travel destination. Streetwise Philadelphia Map is a laminated city center map of Philadelphia, PA. The accordion-fold pocket size travel map has an integrated Septa metro map including lines, stations and bus map. Most people think that Philadelphia = Liberty Bell, but that's only the prologue. Yes, you can find the Bell, Independence Hall and the Congress Hall in Independence National Park, but venture further and you'll find hidden delights. For instance a few blocks away is Elfreth's Alley, the oldest residential street in America that is still home to families and professionals but reverts to its historic legacy with special events held throughout the year. Reading Terminal Market is a gastronomic payday, a giant public market that houses the most delicious offerings from around the region. And then there is cheesesteak perhaps one of the most passionate subjects in Philadelphia. Looking at the STREETWISE® map of Philadelphia, you'll notice that the city is dissected by the Schuylkill and Delaware rivers. Between the Schuylkill and Delaware are the downtown business district, Independence Park, Philadelphia Museum of Art, Society Hill and Penn's Landing. 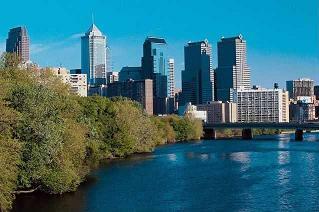 The west side of the Schuylkill is University City where The University of Pennsylvania and Drexel University are located. The STREETWISE® map of Philadelphia lays all this out for you and enables you to master the city and region. The insets on STREETWISE® Philadelphia Map include the Septa transit system and a Philadelphia Center City bus map. The expanded inset map of Independence Park will enable you to locate all the historic sites of Philadelphia. Use the Philadelphia Area Map to navigate throughout the Philadelphia area and the regions beyond. Find the Audubon Wildlife Sanctuary, or Philadelphia International Airport, or the Cherry Hill Mall. On an educational odyssey? Villanova, Bryn Mawr, and Swathmore College are only some of the temples of higher learning. A complete index of streets, hotels, points of interest, shopping, and parks is clearly listed. The pocket size map of Philadelphia is laminated for durability and accordion folding for effortless use. For driving or to plan your trip to and from Philadelphia, use the Michelin New England/Hudson Valley Road and Tourist Map No. 581. The first book in the Come Travel with Me series, this new book offers a kids' eye view of major US travel destinations, including a special "where's the puppy"? feature on every spread! They're perfect gifts to give a child while planning a trip or keepsakes to bring home. Parents will love the "Parents' Pages" at the back, which include fun facts and travel tips about the city. From natural areas and historic areas in and around Philadelphia to the Amish markets of Lancaster County; from historic battlefields at Valley Forge and Gettysburg to the antiques shops of Bucks County and the leisure resorts and quiet nature trails of the Pocono Mountains, this guide offers great guidance for this fascinating region. Areas covered are all within easy driving distance of most East Coast states.